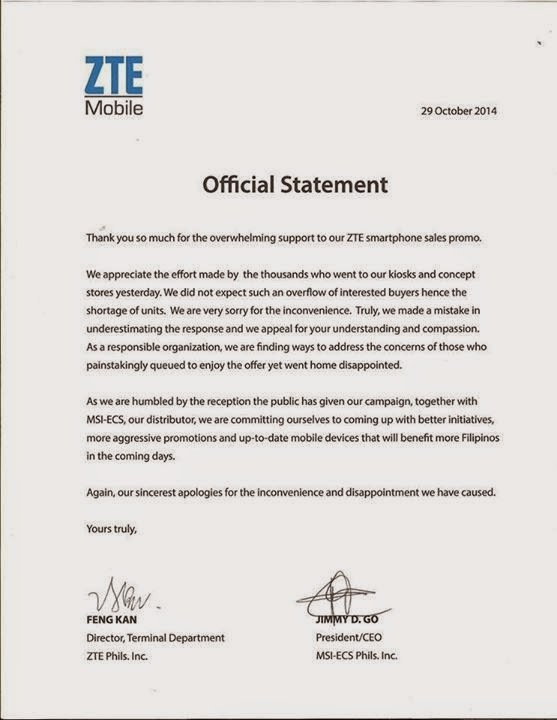 ZTE Philippines Inc. finally released a statement of public apology with regards to their super sales held in seven different ZTE kiosks and stores. ZTE received bashings from netizens who claimed that they had been at the malls and wasted their time just to went home empty handed. ZTE said that they had appreciated overwhelming support they received for their grand promo. Unfortunately, Dir. Feng Kan and MSI-ECS Phils. President Jimmy Go admitted that they had underestimated the people’s response and did not expect such appeal of their promo. 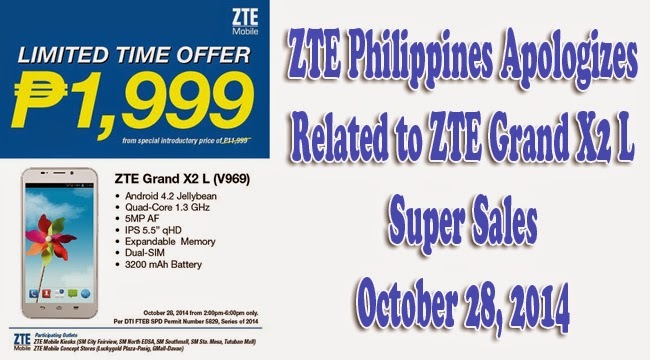 The handset that was put up on mega sale of ZTE on October 28 for 1,999 Php was Grand X2 L that is supported by Android 4.2 Jellybean with a 1GB RAM and has a size of 5.5-inch HD display. Many claimed that the ZTE’ advertising on various websites, newspapers and fliers had been misleading as these ads said ‘limited time’ instead of ‘limited stocks’. Many had claimed on ZTE’s Facebook page that the ads said that the promo will start from 2pm to 6pm, when they got at the stalls right after the mall’s opening hours, the management announced that there were no more stocks left. A Facebook user narrated her experience in a mall in Quezon City. She said that she and her husband had got in the mall at 12pm only to find a crowd that can’t be contained by the security. There had been confusion about the promo. It was said that there had been pink stubs given out as there are only limited stocks available.